Panasonic's DMR-EX79 is a one-box recording studio, bristling with cool DIY dubbing tech: Freeview+ tuner, 250GB of hard drive storage, multiformat DVD recording, a GuidePlus EPG, USB multimedia playback and 1080p upscaling. More than enough to warrant a system upgrade. That said, it's similar to its EX78 predecessor – improvements are evolutionary rather than revolutionary. In a good way. Initial installation is automatic and reliable, and the menus are as thorough and well-organised as ever. The GuidePlus EPG comes with an extremely handy 'word search' programme-finder – which makes scheduling of the 32-event/1-month timer a doddle. 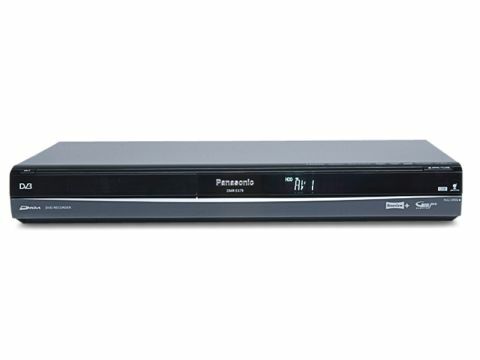 I'm also delighted to discover that the EX79 is Panasonic's first DVD/HDD recorder able to automatically chapter HDD (rather than just DVD) recordings, for quick access to a specific section. The EX79 can also archive from VCRs or LaserDisc players thanks to its analogue AV inputs – a front panel FireWire port does the same from digital-camcorder footage. Once all of this stuff is on the HDD, it can be trimmed or divided before being copied to DVD at high-speed (or 'downconverted', in real-time, to make it fit your disc). DivX/WMA/ MP3/JPEG playback from USB or disc, and a CD-ripping jukebox, also feature. Stopping the EX79 from wowing me completely are some irritating quirks – the power button is next to the disc tray where you'd expect the 'open' button to be, and the front panel display no longer shows which recording mode is in use. It also lacks a second tuner, which will be a deal-breaker for many shoppers. There is an RGB Scart input for Sky or digi-cable, but Panasonic's implementation of GuidePlus stops short of an infra-red wand to take control of your set-top box. Combining manual timer-programming with Sky's planner is just clumsy. Like most of its competitors, the EX79 recompresses the audio and video of a digital channel when recording. In contrast, a typical PVR records the channel's datastream directly to its HDD – a lossless alternative that will always yield superior results. The EX79's recordings show that high-quality AV is nevertheless possible; the trick is to choose the right mode. Under most circumstances the full-resolution LP mode (four hours per DVD) yields superlative detail, certainly until movement and complex scenes distract you with artifacts. For this reason, TV recording benefits from the two-hour SP mode. The exemplary XP (one-hour) mode would be wasteful here; this is recommended only for digital camcorder dubs. At the opposite end of the spectrum is the economy (six-/eight-hour) EP setting, which fails to impresses with its flat, soft and block-ridden pics. It can be useful for Freeview radio recording, though, given that the EX79 lacks an audio-only mode. Sound quality is good with a wide dynamic range and transparent tonal character. And DVD playback, often overlooked on a DVD recorder, is characterised by splendid amounts of SD detail, solid colour fidelity and a decent level of contrast. The EX79's timeshift mode – the video quality of which depends on the selected recording mode – is, however, spoilt by two flaws. An onscreen graphic is constantly-present, and content can't be preserved as recordings. Despite having a few reservations, I found plenty to like about Panasonic's EX79. It strikes a sensible balance between conventional PVRs and DVD recording, and high audiovisual standards are maintained. Panasonic has long owned the higher-end of the DVDR market and it looks likely to hold its position. For those looking for more capacity, the 400GB EX89 is also available, for around £400.